What Do We Mean By "Custom Pultrusions"? Shape: Virtually any constant cross-section part can be pultruded. Resin Matrix: Standard resin systems can be modified or special resins used to address such needs as elevated temperatures or special environments. Typical resins include polyesters, vinyl esters, epoxies, phenolics, urethanes and blend. 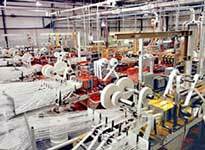 Reinforcements: Typical reinforcements are fiberglass or carbon fibers in multi-filament strands, mat, woven fabrics or stitched fabric. Other reinforcement types and forms are possible. Composite Design: The selection of the resin mix, the type and form of reinforcements, and the placement of reinforcements within the composite are all ways a composite design can be customized. Custom pultrusions contrast with standard "off-the-shelf" pultruded products in which all of the above elements are pre-established. 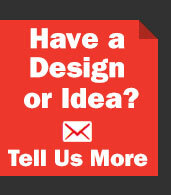 Why Choose Strongwell for Custom Pultrusions? Quality: All Strongwell pultrusion facilities operate under strict quality programs, are focused on continuous improvement and are ISO-9001 certified. Capability: Large parts or small, thick or thin, complex or simple, glass or carbon reinforcements (or both) - if it can be pultruded, we can do it! Strongwell has been pultruding custom shapes since 1956. Capacity: More than 60 machines and the ability to expand quickly assure manufacturing flexibility and no capacity constraints. Structural/Mechanical Engineering: Strongwell has multiple registered professional structural engineers on-staff to help you design a part, system of parts, or structure that utilizes custom pultruded components. Strongwell utilizes both mechanical and structural CAD detailing. Finite Element Analysis (FEA) is used when appropriate. Chemical/Process/Composites Engineering: Strongwell has experienced engineers to help you tailor the reinforcement design and resin system to meet your requirements - and to advise you how to optimize the part for low cost production. Laboratory: All Strongwell pultrusion facilities operate under strict quality programs, are focused on continuous improvement and are ISO-9001 certified. Machine and Tooling Design and Construction: Large parts or small, thick or thin, complex or simple, glass or carbon reinforcements (or both) - if it can be pultruded, we can do it! Strongwell has been pultruding custom shapes since 1956. 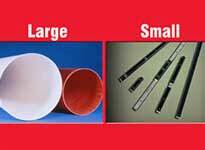 Strongwell produces very large parts to very small parts. Parts can be produced in any transportable length. 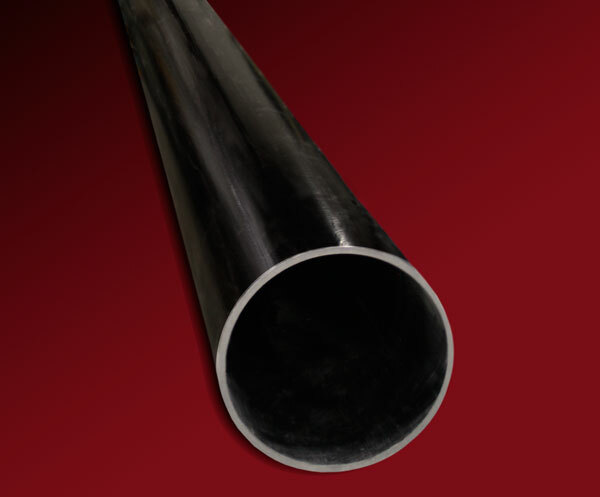 Strongwell can manufacture thin-walled profiles with wall thicknesses under .070" (1.78 mm). 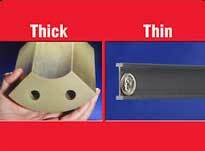 Parts can also be as thick as 2" (50.8 mm) or more. 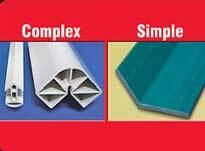 Pultrusions range from multi-cavity, thin-walled, close tolerance parts to simple strips, angles or tubes. 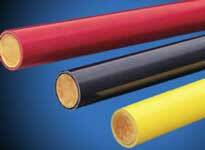 Core materials include aluminum or steel, foam, wood, polyethylene and others. UltraComposite FRP Sheet Piling is an alternative to conventional Sheet Piling and piles such as PZ27 and PZ22. FRP Sheet Piling is manufactured within Strongwell’s ISO-certified facility to ensure projects consistently costs less, have shorter lead times, remain durable, and offer environmental advantages over steel through longer product lifecycles with an emphasis on carbon footprint reduction. Steel pilings are subject to higher labor costs and expensive to transport. Upon installation, ongoing corrosion and oxidation prevention processes must also be implemented. Steel’s shortcomings, including: difficult manufacturing processes, heavy weight, transportation and maintenance are all factors which make UltraComposite Sheet Piling the clear winner against steel piling. FRP Sheet Piling and Pipe Piles are the strongest synthetic piling products in the world. UltraComposite products have reasonable upfront material costs, lower exposure to jobsite risks, low or no maintenance upon installation and lower transportation costs due to the materials having a high strength to low weight ratio. What Information Is Needed for a Custom Pultrusion? A significant amount of information is needed to properly design and quote a custom pultrusion. We suggest you begin by using our Custom Pultrusion Form as a reference.